Ever since its inception, Porsche has always been synonymous with an iconic sports car. This is now expressed in more than 47 models, and always on our terms. PT Eurokars Artha Utama is the sole authorised distributor of Porsche in Indonesia with Porsche Centres in Jakarta and Surabaya respectively. Established in March 2004, the Porsche Centre Jakarta (PCJ) is the only authorised Porsche flagship dealer in Jakarta, Indonesia. The new Porsche Centre Jakarta which is located at Jalan Sultan Iskandar Muda No. 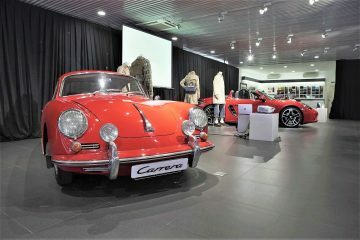 51, Arteri Pondok Indah, together with the Eurokars Group Indonesia Headquarters, is the largest Porsche Centre in Southeast Asia, thus reflecting the commitment that PT Eurokars Artha Utama has staked in Indonesia. Built around the 3S concept – Sales, Service and Spare Parts – as well as the distinctive Porsche corporate identity, the stylish and modern showroom on two floors exudes a welcoming environment while providing a unique purchase and ownership experience for Porsche customers. It consists of a Porsche Driver’s Selection boutique; an Exclusive Fitting Lounge for custom tailoring; a Customer Lounge, and a Carrera Café. Committed to enhancing and continuously maintaining a high level of customer satisfaction, Porsche Centre Jakarta is the first Porsche Centre in the region that features an extensive training facility to equip its Sales and After Sales team with advance knowledge and competencies to achieve exceptional performance towards service excellence. The new Service Workshop in Porsche Centre Jakarta is equipped with state-of-the-art tools and equipment to provide the best care for Porsche owners and customers. It also has a Gold level and two Silver level Porsche Technicians who will ensure that every Porsche car is always well maintained by a team of experts. The Porsche Centre Surabaya (PCS) celebrated its opening in late 2015. Designed with a combination of modern and urban influences that reflect the Porsche brand image, PCS is also a 3S Centre complete with Sales, Service and Spare Parts that is strategically located in the well-thronged automotive district in Surabaya, Indonesia. The Porsche Centre features a showroom on two floors comprising a Fitting Lounge for the custom tailoring and ordering of your dream Porsche; a workshop; Porsche Driver’s Selection boutique, and a customer lounge which collectively offer a one-stop-shop solution for everything Porsche. The compact SUV has been a great success since its launch in 2014, and has now been significantly enhanced in terms of its design, comfort, connectivity and driving dynamics, allowing the Macan to remain the sporty flagship in its segment. The new Macan stays true to the Porsche design DNA with a three-dimensional LED tail light strip. LED technology also features in the headlights as standard. The most striking innovations inside the vehicle include the 11-inch touchscreen of the new Porsche Communication Management (PCM), redesigned and repositioned air vents and the GT sports steering wheel familiar from the 911.